Here’s what’s up in the world of TV for Friday, February 15, and Saturday, February 16. All times are Eastern. 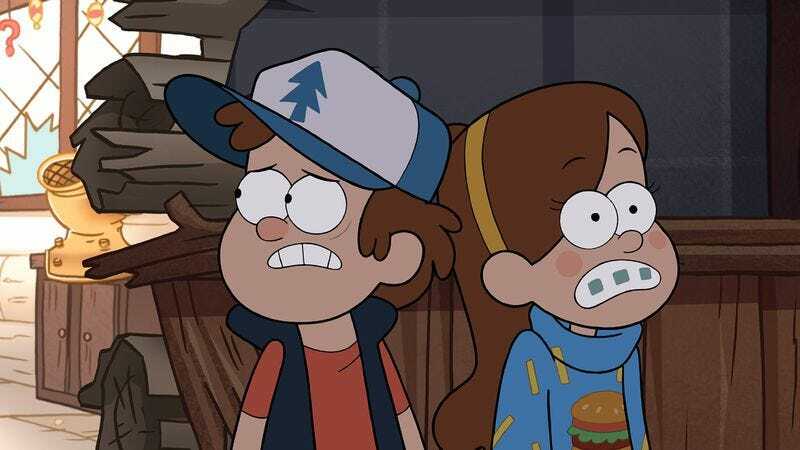 Gravity Falls (Disney Channel, 9 p.m., Friday): Though its first batch of episodes were surprisingly high-rated, the Disney Channel is sure treating this animated treat like many of The A.V. Club’s other favorite shows, yanking it from the schedule for long periods of time, then returning it mysteriously, before yanking it again. The point is: If you like this show, you had better check it out tonight, before it disappears like a strange mirage, the TV cartoon equivalent of Brigadoon. Alasdair Wilkins has been weeping drunkenly at a bar, awaiting its return lo these many months. House Of Cards (Netflix, 1 p.m., Friday): Todd VanDerWerff’s review of the full season will drop Monday, but Ryan McGee will continue to carefully pick his way through the season, one episode at a time. This week, he gets to that episode about the Peachoid, and it’s apparently a real thing. Weird! Portlandia (IFC, 10 p.m., Friday): This series is leaving us almost as soon as it joined us, seemingly, but we’ve still got a couple of weeks of wacky Portland fun. This week, Les Chappell watches as coyotes threaten the city, then grabs his trusty shotgun. No coyotes are getting into his house tonight, no sir! Young Justice (Cartoon Network, 10:30 a.m., Saturday): The episode description for this one features somebody named “Sportsmaster,” who just has to be made up. He has to! Oliver Sava hopes he’s just some super cool guy who wears a letterman’s jacket everywhere. He would be the best superhero ever. Saturday Night Live (NBC, 11:30 p.m., Saturday): The unlikely Oscar campaigning continues, as Best Supporting Actor nominee Christoph Waltz hopes to parlay his work in Django Unchained into hilarity. Though if you read our Monday Inventory, you’ll see Waltz has had mad sketch comedy skills for a while. The X-Files (1 p.m., Saturday): The X-Files reviews are going away for a while, to make room for The Twilight Zone again, but before then, Todd VanDerWerff is going to watch Mulder meet a genie. If Todd had three wishes, they would be as follows: world peace, a great sandwich, and a ride-able hippo. Dateline NBC (NBC, 8 p.m., Friday): Hey, you remember that thing where NBC has Grimm, that show that does better than many of the things on the network and makes it competitive on Friday nights? Remember how the network is keeping it off the air until March? Enjoy a two-hour Dateline, suckers! The History Of The Eagles (Showtime, 8 p.m., Friday): Both parts of this story about what made the famous band that put Winslow, Arizona, on the map what it was will air this weekend, but tune in for part one tonight, and remember that you can check in any time you like, but you can never leave. Live From Lincoln Center (PBS, 9 p.m., Friday): If you enjoy the musical stylings of John Kander and Fred Ebb, one of the greatest teams to ever write Broadway musicals, then this concert might be just the ticket. Enjoy songs from—we’re assuming—Cabaret, The Rink, Chicago, and a host of other great shows. Funny Or Die’s Billy On The Street (Fuse, 10 p.m., Friday): Every week, one of you asks us to put Billy On The Street on the list, and every week, we kick ourselves for forgetting, since it’s a fine and funny show. Well, consider this your reminder: There’s a new episode tonight; maybe you should watch it! Wendell & Vinnie (Nickelodeon, 8 p.m., Saturday): Nick replaces its biggest hit—Victorious, which has ended its run—with a new series starring iCarly’s Jerry Trainor as a wacky uncle who ends up the guardian of his uptight nephew. Will viewers learn the uncle is the real kid here? Signs point to yes! Beyonce: Life Is But A Dream (HBO, 9 p.m., Saturday): Hey, guess what, everybody?! Beyonce Knowles directed a concert movie and got HBO to put it on the air. If you enjoyed her Super Bowl halftime show, you might enjoy this. If you didn’t, what else do you have to do? Beyonce owns you, puny human. Mommie Dearest (Sundance, 8 p.m., Friday): “No wire hangers!” shrieks Faye Dunaway, in one of the great campy moments in the movies. This one might have torpedoed Dunaway’s career for a while, but watching it now, it’s impressive to see how committed she is to the whole Joan Crawford ethos. Grand Hotel (TCM, 9:45 p.m., Friday): The only movie to win Best Picture without receiving any other nominations for anything, Grand Hotel is one of those movies your grandmother insists they don’t make ‘em like anymore, a big, star-studded extravaganza that doesn’t make a lot of sense but is still fun. Despicable Me (Disney Channel, 8 p.m., Saturday): We were sort of surprised when we learned that this movie was so beloved by so many. It’s certainly not bad—and Steve Carell’s voice performance is a lot of fun—but it seemed like a pretty generic animated family film to us. Convince us that we’re wrong. NBA All-Star Celebrity Game (ESPN, 7 p.m., Friday): A motley crew of celebrities gather together to play a little basketball with former stars of the NBA and WNBA. Everyone from Usain Bolt to Josh Hutcherson will be playing, but the real attraction is seeing how Secretary of Education Arne Duncan fares. NASCAR Racing: The Sprint Unlimited (Fox, 8 p.m., Saturday): Say what you will about NASCAR, that it’s just cars going in circles or whatever, but we’re pretty intrigued by that name. Sprint Unlimited! We have to assume that it will involve the cars bursting from the racetrack and driving through urban areas. Elementary (Thursday): An amazingly fun twist is the highlight of this episode, and Myles McNutt celebrates the show’s growing confidence. If you’re looking for a fun detective show—and who isn’t?—and can get over your love for Sherlock to embrace a different take on the material, check it out.